She couldn’t explain how she ended up standing over the body of her former lover, her sister’s husband, as he lay dead in her bed. But the events of that night, impossible for her to recall, would force Kip Czermanski to question everything she believes in and everything she thought she understood about herself and her family. And they would change her life forever, whether she is found innocent of murder or not. A.G.S. Johnson’s novel, set in the turbulent and transformative Vietnam War era, blends the mystery of a whodunit with the intrigue of an epic family drama. As the plot unfolds, it reveals how the lenses through which we view the world can blind us. And it considers the degree to which the roles we’ve chosen in our families and in our lives impact our present and future. Sprinkled among these greater themes are worthwhile questions about the boxes to which we relegate ourselves and others. It all begins in 1972, when Kip Czermanski finds herself on trial for a murder she is sure she did not commit. With all the evidence against her, she’ll face a small-town judge prejudiced against her and a community that has labeled her “a troublemaker” from childhood. Her feminist, anti-war activist past only increases their disapproval, and, even worse, she remembers nothing about what happened when the murder occurred. With the help of her lawyers, one of whom dislikes her, she must uncover the truth. To that end, she delves into her painful past of family dysfunction and a young love that was crushed and as she begins to understand and accept her life, she just might piece together the puzzle and convince the jury of her innocence—if any of them have an open mind. Readers are kept intrigued as they travel back and forth through time with Kip’s recollections. Johnson’s masterful use of recalled memory allows the mystery to develop even as character studies and family heartache remain a primary focus. This method also allows the book’s larger social concerns to share the spotlight without the suspense diminishing or the story becoming a cookie cutter courtroom procedural. 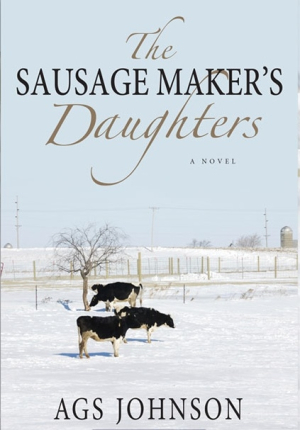 The Sausage Maker’s Daughters is for anyone who loves legal suspense, murder mysteries, or family drama.